What’s that, you say, you’ve been missing all my rambles on baking since the end of this year’s Thingadailies? Don’t worry, I’ve got you covered. Yes, that’s right, it’s time for another #BakingSisters bake! This weekend my parents were up in Seattle in order to visit with my sister and also see my niece play a mermaid in her last high school play (because somehow she is now a senior, even though I can’t figure out how that happened because the rest of us certainly haven’t aged that much since she was born, right? Oh, wait…. 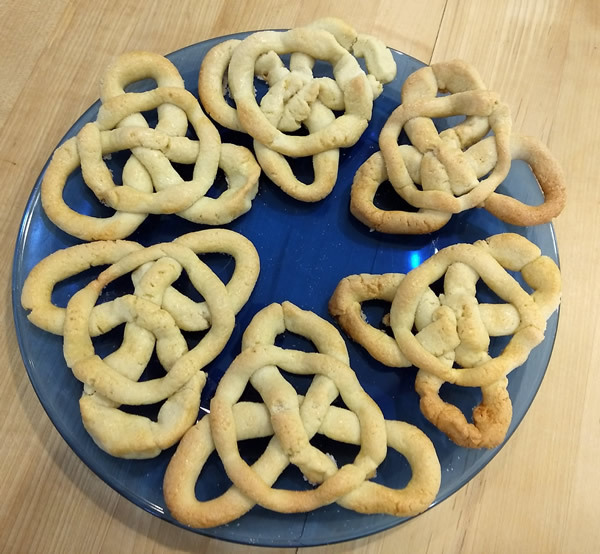 Anyway, because they were visiting and because things were going to be busy with the play, this month we decided to do cookies – specifically Tudor Jumbles. These were a recent Technical Challenge recipe on the Great British Bake Off, should the name sound familiar. The dough itself is pretty basic – flour, sugar, butter, some flavorings, and an egg. Where it gets complicated is with the shaping, because you can’t just plop a lump of dough onto a sheet pan and call it done. No, these had to be carefully knotted into complicated shapes, then brushed with egg wash and sprinkled with sugar before baking. My sister (with my mom joining in) made the dough in that recipe above. I, however, do not like either caraway seeds or anise (licorice) flavoring, so I went a bit off script. I made two half-batches of dough – one with ginger, and one with some almond flour (primarily because I had some that needed using up) and almond extract. The first shape is a circular knot. The dough I flavored with ginger was really, really dry and it was actually pretty hard to ‘knot’ the rope of dough without it cracking into a million little pieces. The second shape is a triangle ‘knot’. I know that technically I should have figure out a way to do it all with one single continuous rope of dough, but this one was a nightmare to shape to begin with (the almond dough was a lot softer than the ginger dough, to the point where I actually ended up kneading in a whole lot more flour prior to shaping, just so it would be firm enough to work with), and any attempts to weave the circle through the triangle points just ended up with broken dough and a lot of under-the-breath swearing. Shaping these cookies was not a quick process, and it seems rather anticlimactic that for all that work, you only end up with 12 cookies in total. They’re also *big* cookies – each one is a couple inches across. Verdict: Eh. The flavor’s not bad, but it certainly wasn’t worth all the effort of making the knots for just an okay cookie. 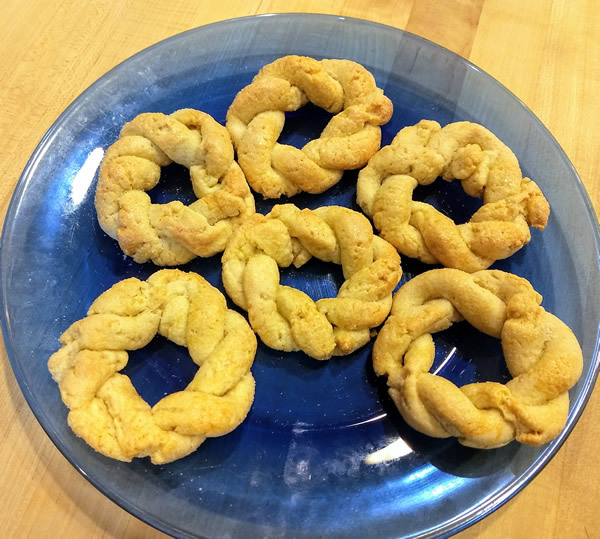 My sister did comment that it might be fun to try the knots again with a different type of dough – perhaps a gingerbread – that had a little more pliability, and a lot more flavor. So we’ll see – maybe come Christmas time I’ll feel the urge to wrap dough into stupid little knots again. Or maybe….not.